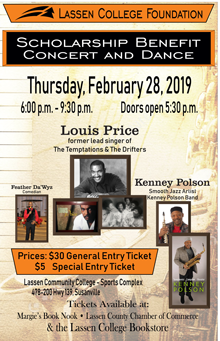 Lassen Community College will be holding a scholarship benefit concert and dance at the college’s sports complex February 28th, featuring Louis Price, past lead singer of both The Temptations and The Drifters, a crowd favorite who has won over audiences at the February show for the last six years. All proceeds benefit the Lassen College Scholarship Foundation. Last year’s exceptional performance included songs like Just My Imagination, My Girl, and Ain’t too Proud To Beg. Opening for Price will be smooth jazz Saxophone artist Kenney ‘Sax Man’ Polson. Polson’s influences include Najee, Grover Washington, Gerald Albright and Eric Marienthal. You might also hear a bit of Brazil in his music as he lived in Rio de Janeiro for five years. The evening will also include a performance by comedian Feather Da’Wyz. The concert and dance will run from 6:00 to 9:30 on February 28th, doors open at 5:30. 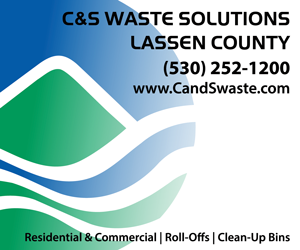 General Entry Tickets are $30 per person, Special Entry Tickets are $5, and are available at the Lassen Community College bookstore, Margie’s Book Nook and the Lassen County Chamber of Commerce. 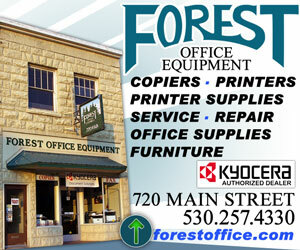 For more information call 530.251.8820.